Take a bowl and add all the fruits. 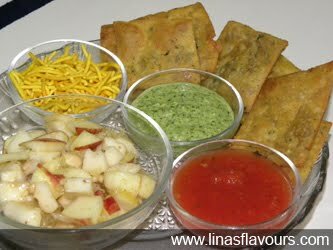 Add salt, pepper, chaat masala and put it in the refrigerator for about 15-20 minutes. Take a dish. 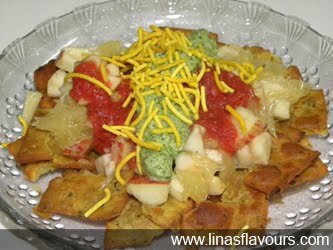 Crush some puris and spread it in the dish, put next layer of fruits, pour tomato sauce, green chutney, sprinkle some chaat masala and finally sev on the top.